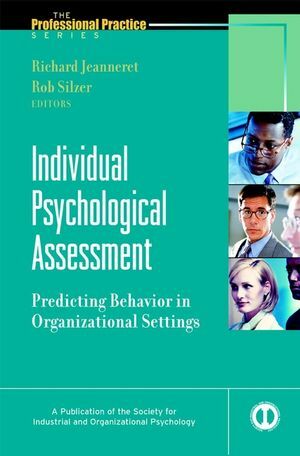 Presented by the Society for Industrial and Organizational Psychology, this is the first and only work to offer readers a comprehensive look at individual psychological assessment as currently practiced in business environments. Here, you will examine the best methods and techniques now in use. You will see how assessment is being used to alter organizational cultures and achieve specific business goals. You will discover a framework you can use to make your own practice state-of-the-art. And you will benefit from thought-provoking discussions on issues vital to the field's continued success as well as informed predictions for its future. All of which makes this an essential resource any person concerned with individual psychological assessment should possess. RICHARD JEANNERET is president Of Jeanneret & Associates in Houston, Texas. He lives in Woodlands, Texas. ROB SILZER Waiting for bio info. He lives in New York, New York. An Overview of Individual Psychological Assessment. Individual Assessment: The Research Base. Ethical, Legal, and Professional issues for Individual Assessment. Getting at Character: The Simplicity on the Other Side of Complexity. A Clinical Approach to Executive Selection. Assessing and Changing Managers for New Organizational Roles. Shaping Organizational Strategy Leadership: The Ripple Effect of Assessment. Anticipating the Future: Assessment Strategies for Tommorrow.